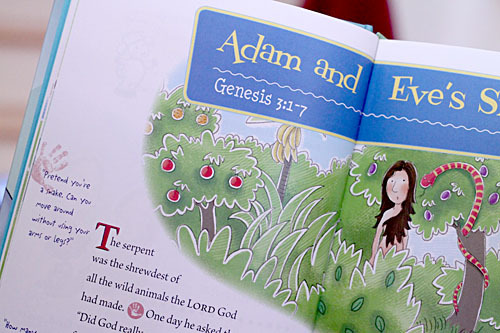 Though titled for preschoolers, My First Hands-On Bible is, actually, a great Bible Story teaching resource for families with young kids. It contains 85 stories, in the New Living Translation, canvassing the Old and New Testaments–along with illustrations, simple in-story interest grabbing activities, optional added crafts or reinforcing activities, and application questions. This is a simple and easy to use tool that can go a long way toward helping parents start and maintain a regular Bible Study for their families. Telling the stories of the Bible in order (Chronological Bible Storying) is a classic way of teaching a basic understanding of God and of the unfolding of the Gospel. The activites are simple and fun, and the stories are well-chosen. The New Living Translation is a great choice for this usage. It is not a complete Bible – which is not a criticism but just something to be aware of. No prophets, no poetic books, no epistles – just stories from the narrative portions of the Bible. So, while this is a great tool for family studies, it is not enough for later individual study. Parents will still need their personal study in greater depth, and as kids reach preteen and later ages they will need to begin learning to study a complete Bible on their own. I strongly recommend this Bible for families with younger kids, even if you have some older kids too. 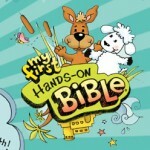 You can use it anytime and anywhere to teach your kids the Bible in a simple and engaging way. My family uses it at the dinner table twice a week, which will put us through the Bible story within a year! Each story is chosen directly from the Bible in the New Living Translation. They’re presented in large print, double-space type so that the parent can read quickly and still engage with their children. Each story goes across several pages, leaving room for cartoon illustrations, as well as for the extra activities. As you read along, markers after sentences indicate a special activity for your kids – simple ones like pretending to be a character or do the action in the story or finding an object in the picture. They are the sort of activity a good storyteller will often insert into a story they are teaching a young child. 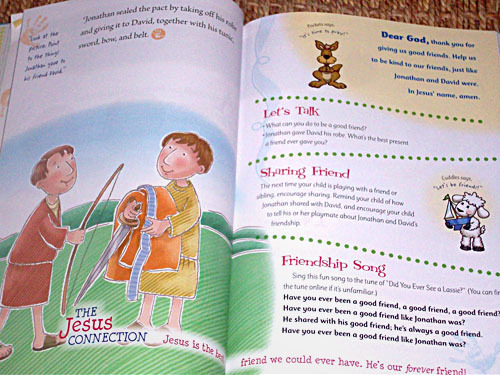 At the conclusion of each story, there is a “Jesus Connection” that ties an idea from each story to who Jesus is and what He has done for us. In addition, there are more in-depth activities – such as a snack, craft, cheer, or song that relates to the story. Finally, each story has 2-3 application questions and a suggested prayer. Some might quibble at the use of the New Living Translation. It is a paraphrase translation – and not one I would use for my personal Bible study. However – it is an excellent translation for narrative storytelling at a child’s level – and is perfect for this usage. Consider asking specific questions to review the story. Reinforcing praise for correct answers will encourage kids and teach them better listening habits. Do or skip activities based on where you are and what you’re doing. The stories are engaging on their own, so if you’re sitting at the dinner table, you can choose to skip the “march around the room” suggested activity. Have younger kids that you don’t think are “getting it”? Just remember that they understand a lot more than they can communicate, and just stick with it. All kids enjoy stories, even when they’re missing half of it. You might be surprised what they remember next time! Feel free to tell the story more than once in a night or in a week… Repetition has always been used in oral cultures to help kids remember and repeat the stories that are so important to them. Have older kids that think they’re beyond marching around the room like Joshua marched around Jericho? Start letting them take a lead in the stories. Let them be the lead actor for the other kids, or even begin letting them tell the stories and lead discussion. It’s good practice for them to learn to minister to others, it helps them to remember the narrative of the Bible, and it’s a good transition tool as kids get older and begin learning responsibility and leadership! You might come across a “Jesus Connection” that you think is a bit of a stretch, or an application question that you think misses the point. Use your discretion and feel free to skip it. So far, I’ve been pretty happy with what I’ve seen in the book, and think that the guides at the end of the stories are useful and pretty safe – but they’re not perfect! Consider a goal of having your kids be able to tell the stories from memory. It’s a big goal, and would take some time – but how amazingly helpful to have 85 of the basic stories of the Bible memorized in order in your head, that you can fit more teaching and Bible into as you learn? your book reviews are always helpful….can you write a review on the biblical foundations for baptist churches by John S. Hammett. It would of a great help.